Last year we’ve interviewed many wonderful chefs who gave us simple and easy tips on how to reduce food waste and increase kitchen profitability. We’ve collected the best food waste tips from 2017 to help you this year. Last year we achieved great results. Together Winnow users saved the equivalent of £11.5 million, which is the same as saving 22 meals per minute, the equivalent of feeding over 31,500 people. It was all thanks to the incredible work of chefs and teams who help us on a daily basis, making a tangible change in food waste. We had the opportunity to interview many of these amazing professionals, who gave us valuable tips on how you can prevent food waste, have a more profitable kitchen and help the environment at the same time. We’ve put together the best tips from 2017 that will help you prevent food waste through 2018. In 2017, we had the pleasure to interview a female chef for the very first time. Anne-Cécile Degenne is passionate, talented, and one of the most prestigious chefs working in Southeast Asia at the moment. Originally from France, she has worked for culinary legends such as Jean-George Vongerichten, took part in Top Chef France Season 5 and opened several successful restaurants for Accor Hotels. Tom Hunt is a renowned chef and food waste activist. He is the author of The Natural Cook and founder of Poco restaurant, 2016’s Restaurant of the Year at the Food Made Good Awards. Tom’s aim is to reduce food waste by encouraging people to eat for pleasure and use produce in its entirety. October of 2017 was an important month for the Winnow team and users. We launched our #ForTheLoveOfFood campaign to celebrate food and all chefs working to reduce waste. In the same month, we had our 10th Chef’s Table interview where we talked to Thomas Thinning Petersen, Executive Chef at Hotel Scandic Copenhagen. “Chefs who are looking to reduce food waste need to invest in technology to help them keep track of everything that is going on in the kitchen. It doesn't matter how good or experienced chefs are, we will never be as accurate and efficient as machines. We just can’t be on top of everything, all the time”. In 2017 we had the pleasure to talk to Executive Chef Jirayu Kongjan, from Novotel Phuket Kamala Beach. He is well-known to our team in Singapore. With the help of Chef Jirayu, Winnow partnered-up with Novotel Phuket Kamala Beach to put together an event aiming at promoting food waste reduction efforts in the Asia Pacific region. We also love working with contract caterers, and in 2017 we had the opportunity to speak with Robert Neary, Development Chef at Elior. Neary started his career in hotels and moved into contract catering in 1994. Before joining Elior in 2012, he had worked for different contract caterer companies including High Table, Sutcliffe Catering, Restaurant Associates and Baxterstorey. He opened up to us about his mains challenges when implementing a food waste strategy, and how he managed to overcome them. As for many other chefs out there, Robert had a challenging time getting his team on board: “Any change in a kitchen is a challenge because we all work under huge pressure. We have set ways of doing things and to change that can be a challenge. Most of the Chefs don’t see the benefit of food waste reduction. They think they don’t have the time to manage waste or that they already managing food waste efficiently”. But, after raising awareness about the issue and engaging his team, Robert managed to get everyone's collaboration and started implementing different strategies to reduce waste. “We have reduced service times in some areas, we have changed menu cycles on salad section, we have reduced our production numbers which in turn has reduced our labour pressure”. Want more tips for embracing zero waste in the kitchen and increase your kitchen’s profitability? 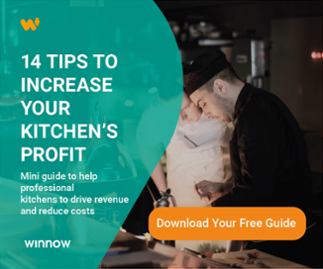 Download our guide below, and learn the best initiatives you can start implementing in your kitchen straight-away.